Langdon the Lion takes his job as “Guardian of the Bridge” very seriously. Most people think this means allowing travellers to cross the Rochester Bridge free from fear of mice (admittedly that is a very big part of his job), but he’s also responsible for looking after the bridge itself. 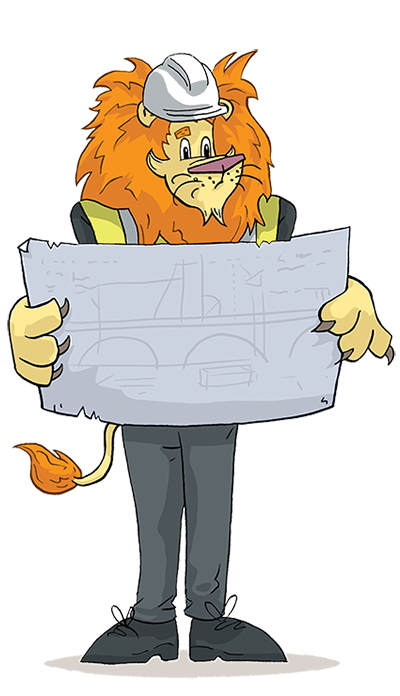 As a civil engineer, Langdon regularly dons his hard hat and goes out to inspect the bridge, walking over and under it to check the condition of the girders and ensure all the rivets are in place. He likes this because it’s an opportunity for him to get out of the office and survey his work. Back at his desk, he makes notes of his inspections and arranges for any maintenance to take place. This ranges from ordering replacement parts to arranging for the bridge to be cleaned – the better he looks after the bridge, the longer it will stand. Another of his jobs is pondering plans for bridges. While the bowstring truss is his favourite, Langdon regularly reviews different designs and draws up blueprints for future river crossings. This is important because there has been a bridge at Rochester for almost 2,000 years and, should the current bridge ever need replacing, Langdon likes to be prepared.